4º R 81 (1) Th. Engraving from an edition of Jacob Judah Leon’s De templo Hierosolymitano. Leon achieved considerable fame in the mid-seventeenth century through his three-dimensional model of the Temple which was exhibited in Amsterdam; so much so that he himself was referred to as ‘Templo’. Catalogue no.57, plate facing p.35. Leon (see previous entry) was so associated in the public mind with his model of the Temple that he was given the name ‘Templo’. The model was displayed with great success in Amsterdam, while his book was translated and published in eight languages. This edition is a Latin translation of 1665 by Johannes Saubertus, with fine plates. It is a straightforward account of the Temple and its contents, and of the nearby Palace of Solomon and the Antonia Tower, and could equally well serve as a description of the model. John Dury wrote to Samuel Hartlib in 1646, in connection with their interest in the Dutch Hebrew scholar Adam Boreel, that Boreel had been studying the Jewish Mishnah with Leon. Leon was identified as the builder of the model of the Temple, which Dury had seen in the Netherlands, judging that ‘amongst all the Rarities & Antiquities which are to bee taken notice of there is none to bee compared thereunto’ (Hartlib Papers, 3/3/32A–33B). Leon’s models of the Temple and the Tabernacle were brought to London in the mid-1670s, and an English summary of both descriptions, dedicated to Charles II, was published in Amsterdam in 1675. Constantijn Huygens provided Leon with a letter of introduction to Christopher Wren, who would be able to judge the models and introduce Leon to the circle of the Royal Society. Whatever the motive for this move, whether connected with mathematical interest in the Temple or with millenarian aspirations that necessitated its reconstruction, they were overtaken by Leon’s death in July 1675. However, it seems likely that it was in this connection that Robert Hooke recorded early in September, ‘With Sir Chr. Wren. Long Discourse with him about the module of the Temple at Jerusalem’ (Robinson and Adams, p. 179). 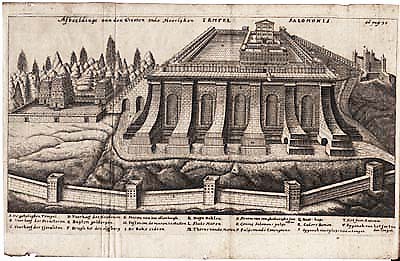 A.K.Offenberg, ‘Jacob Jehuda Leon (1602–1675) and his Model of the Temple’, in J.van den Berg and E.G.E. van der Wall (eds. ), Jewish-Christian Relations in the Seventeenth Century (Dordrecht, 1988), pp.95–115; R.H. Popkin, ‘Some Aspects of Jewish-Christian Theological Interchanges in Holland and England 1640–1700’, in van den Berg and van der Wall, op.cit., pp.3–32; C. Provoyeur, Le Temple: Représentations de l’architecture sacrée (Nice, 1982); H.W. Robinson and W. Adams (eds. ), The Diary of Robert Hooke, 1672–1680 (London, 1935).